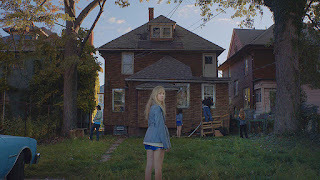 It Follows is a horror film that provides just the right amount of tension without relying on the overused jump scare or even worse the false jump scare. Everything inside this small yet terrifying movie does exactly what it needs to do and creates a unique idea and environment for a horror film. As someone who is not a big horror movie fan, it takes a lot to get me excited to see a film in this genre, and especially to be one of my most anticipated. But It Follows managed to do it, and certainly lived up to my expectations. The concept is relatively simple. Jay Height (Maika Monroe) has an innocent sexual encounter, or at least that’s what she thinks. It all turns when she is told by Hugh (Jake Weary) that he passed “It” to her. It, in this situation, being an entity that can take any form to get close to whoever has the curse, and the only way to rid yourself of It is to pass it on. The score is fantastic and really sets the creepy vibe the film is attempting at. With its electronic, sharp sound it creates a chaotic atmosphere, much like John Carpenter’s old scores, while not being too overdone. This combined with the cinematography create all the tension you need without always showing It. The director, David Robert Mitchell, must be complimented as well. His direction helps create a unique environment that could be taking place in any time period but still clearly in Detroit. Maika Monroe is the stand out of the actors in this film. Her performance is able to capture the fear her character has of the idea of It being anyone or anywhere really well. I’m not sure whether I like it better than her performance in The Guest (2014), but it’s pretty close either way.